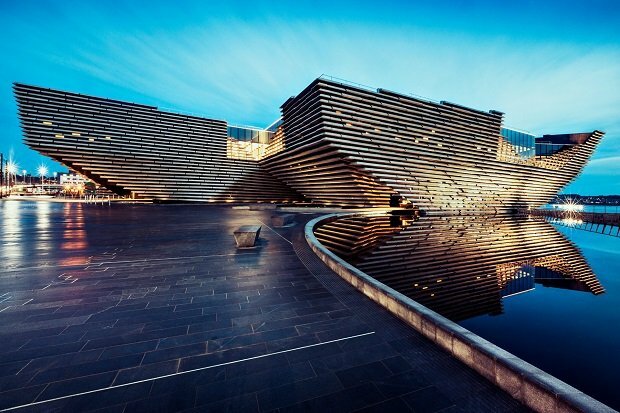 Designed by acclaimed Japanese architect Kengo Kuma, Scotland's first design museum, the V&A Dundee is set to open its doors to the public for the first time on Sat 15 Sep 2018. The long-awaited venue is marking the occasion with a free two-day celebration of design, music and performance. The 3D Festival is a key event in Scotland's Year of Young People 2018 having been co-designed by DF Concerts and Events in collaboration with V&A Dundee's Young People's Collective. The architecture will provide an astonishing backdrop for the event which runs next to the museum on the evening of Fri 14 Sep and daytime Sat 15 Sep at the city's waterfront park space, Slessor Gardens. A unique light and sound composition created by Biome Collective promises to bring the building to life for the duration of the events. An impressive lineup of Scottish talent has been revealed. Legendary Scottish rockers Primal Scream will headline the 3D Festival on Friday night. Formed in Glasgow more than 30 years ago the band continue to enthral audiences with their unique blend of indie, acid house, dub electro and rock 'n' roll. The band have also collaborated with contemporary visual artist and former Turner Prize nominee Jim Lambie on a special commission that will be revealed on the night. Other Scottish acts to take to the stage over the weekend include: Scottish singer-songwriter Lewis Capaldi, Dundonian singer-songwriter Be Charlotte and member of the culturally acclaimed Lucky Me Collective, DJ Eclair Fifi. For the chance to secure tickets for Friday's event hopeful attendees must register their details to enter the ticketing ballot. The ballot is free to enter and will close on Fri 10 Sep. Successful applicants will be eligible for up to four tickets for Friday's event. Saturday's family-focused programme of events is free and unticketed. Up to 20,000 people hailing from Dundee, Scotland and elsewhere in the world are expected to attend the two-day festival. Highlights of the which, will be broadcast on BBC Scotland. Due to high-interest free entry to the museum will be ticketed over the opening weekend which must be booked in advance. The 3D Festival is supported by a number of bodies including EventScotland, Brewin Dolphin, DC Thomson, NCR and Arts & Business Scotland via Culture & Business Fund Scotland. V&A Dundee's 3D Festival will take place Fri 14 Sep and Sat 15 Sep at Slessor Gardens. The ballot for tickets is now open and will close on Fri 10 Sep.